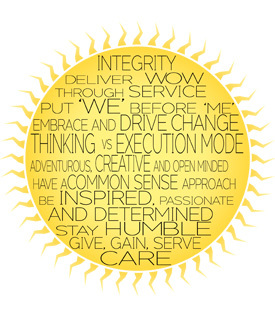 Our core values make us who we are. As we change and grow, the beliefs that are most important to us stay the same - putting people first, pursuing excellence, embracing change, acting with integrity and serving our clients the very best we can. INTEGRITY - our principles of honesty above all to ourselves are translated into full transparency to our clients. DELIVER WOW THROUGH SERVICE - outstanding quality in everything we do is our objective by bringing TRUE value to our clients. We believe our own training and improvement never stops. We aim for the WOW factor and not just meeting your needs. Our focus is to be the BEST in whatever we do and all our energy is pulled in only that direction. ‘WE’ THINKING vs ‘ME’ THINKING APPROACH – we believe working as a team within our organisation as well as with the client is fundamental for our success as well as our clients’ success. We are an extension of our clients’ team. EMBRACE AND DRIVE CHANGE – in the pursuit for growth and learning – use adversity as challenges not roadblocks to learn and do more and more. THINKING v EXECUTION MODE – be adventurous, creative and open minded – posses a willingness to open our minds and have non-linear thinking processes. We apply ‘thinking’ v execution in everything we do. DO MORE WITH LESS. COMMON SENSE APPROACH – we don't beat around the bush. We use common sense in everything we do. WE CARE - create family spirit and a sincere and caring environment. BUILD OPEN, HONEST RELATIONSHIPS with COMMUNICATION and TRUST among colleagues and clients. GIVE. GAIN. SERVE – we believe we are here to SERVE – TO SERVE OUR CLIENTS with massive value and give more than anyone else does. TO SERVE BY GIVING BACK to the broader global community – our society and humanity. TO SERVE each other by building a caring and safe environment where everyone feels they can truly be themselves.